Erase years from you skin naturally…..
Photo rejuvenation is a natural, pain free way to erase the appearance of wrinkles, age spots, sun damage, stretch marks, scars, capillaries, acne, coarse skin, large pores and age produced flaws. Promotes ATP collagen and elastin production. It is to be followed up with a chemical peel. 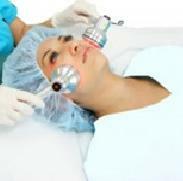 We also offer the light mask that can be added in 6 different ways. We can use it on the face, head, and eyes, under the chin, neck, mouth and all areas of concern. Consist of two light diodes for a total of 312,000 of milli-candels of power. Blue Color: works with stimulation, energizes scar tissue, tendons and ligaments. Red Color: works on bones, joint muscles, ligaments and organs, heart, lungs, reproductive organs, sinuses, gums, teat and both are a pain buster. Add this service to any of your regular appointments while visiting your professional today.